From an idea of an original Quang Nam people who has long time attached to silkworm and mulberry tree in Duy Xuyen Commune of Dai Loc District, the village was born to restore the culture of weaving fabric career and to provide tourists more knowledge on the history of this traditional career. Hoi An in the past was a port shipping silk to the world. Local people take pride of the place where the silk road on the sea took shape. The village is where tourists can get a glimpse into the making process of Quang Nam’s traditional silk and Cham people’s brocade cloths. Tourists to the venue can study 40 kinds of mulberry, ancient styles of looms and silkworm breeds, among others. “The Silk Village is where we preserve a precious collection of related items to the weaving fabric career and a collection of ruong houses (traditional houses in Quang Nam architectural styles). Additionally, we also make Quang Nam silks here,” said Le Thai Vu, director of QuangNamSilk Company. “For over ten years, I have put effort on collecting ruong houses nationwide, hundreds of years old mulberry kinds and ancient looms to equip for the village,” Vu added. Tourists can also admire a collection of old costumes by 54 ethnic minority people in Vietnam displayed in ancient houses there. Those who wish to have a tailored costume or eat traditional Quang Nam food like cao lau (a soup made with noodles, pork and greens), mi Quang (noodles in Quang Nam style) and com nieu (rice cooked in earthenware pot) can ask artisans at the village. 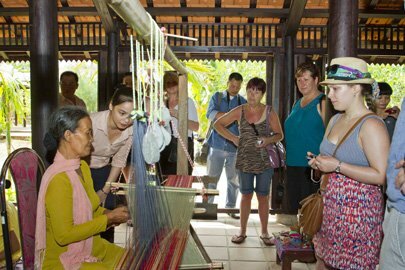 Silk Village is located on the road leading to Hoi An ancient town. This tourist and cultural site is 30km away from Danang downtown to the Road 607. Tourists can take a 30-minute bus which costs them VND20,000 (around US$1) to get to the site. For further information, contact the QuangNamsilk at 28 Nguyen Tat Thanh Street, Tan An Ward, Hoi An City, Quang Nam Province, tel: (84-510) 392 1144.